This is my home DIY guide on how to fit floorboards. If you can’t see the video please click here. OK so that’s a slight exaggeration, but it is something I’ve shied away from until Doug the builder pointed out than even an idiot can do it. I tried to not take that personally. As the only place left at my house without finished floors was my summerhouse, this was our chosen location. I can’t imagine why but I almost felt embarrassed choosing floorboards for what is essentially a posh shed, but hey it’s all in the name of education so I’m over that particular first world issue now. I chose Professional fast fit V groove laminate flooring in dark grey from Howdens, Cambridge at Coldham’s Road. They are aquablock so appropriate for areas that might have variations in temperature and contact with water. 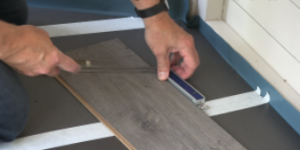 Obviously you should have already done the measuring before buying the flooring, but always allow for 10% waste as you don’t want to run out once you’re in the zone! Best to measure by square meter as that’s the system mainly used by the floorboard manufacturers. The boards need to sit in the room for 4-7 days before fitting to acclimatise to the temperature and moisture level of the room. Next up you want to measure the damp proof membrane. This stops any moisture from coming up through the floor. Allow 100mm excess to go up the walls. Lay it in place with the overspill up the sides and then cut accordingly. Next up is the underlay. You can hold the sheets in place with masking tape so they don’t move when you lay the boards but this isn’t always necessary. As an amateur it probably makes sense to do this to make life easier though! When laying the boards you need a 10-15mm space between them and the walls to allow for expansion. Half the battle is starting in the right place so you don’t have too much wastage. It’s best to begin at the back of the room. Using a sliding bevel will help you to get the angles right. Generally the offcut of the end board then starts the next row. You measure the bit you’re going to be fitting into the previously fitted board to know where to cut. Using a jigsaw cut the boards to size and shape – always use goggles when doing this as it tends to throw up shards of laminate. If you haven’t got a jigsaw you can use a hand saw of course. It’s really important to get the first row right as this puts you in good stead for the rest of the boards. Get this wrong and the whole lot will be wrong. When starting the second row, fit one in the centre to hold the first row in place. If you were doing this properly and thoroughly you would have removed the skirting board first. Of course that isn’t always possible as old skirtings with decades of paint aren’t keen to come away cleanly, in which case you need scotia to give a neat finish around the edges. If you’re going to paint the scotia, you may want to mask the edges before you fit it. You fix the scotia into the wall, not into the floorboards themselves! Either pin it with hand pins or a gun if you have one. Paint the scotia, remove the masking tape and do a celebratory dance – preferably without tap shoes on! This was particularly hard work for Doug the builder as not only was it an incredibly hot day, so like working in a greenhouse, but also getting the angles right takes most of the time. There are very few rooms with as many angles as my summerhouse, but Doug the builder handles these things so easily I like to throw in some challenges to keep life interesting for him! “Even an idiot can lay floorboards”! Not so sure about that Georgina, you’ve never seen my DIY skills!! He really does, and it would take us a lot longer, but where there’s a will…or I could just loan Doug the builder out!!! Ha ha! To be honest if I started now I’d be struggling to finish by Christmas!!! It’s a similar sequence to when I’m doing my cutting out for dressmaking so makes absolute sense, thank you once again for invaluable advice, keep it coming!